15 Minutes by L. Douglas Keeney - Doug Grad Literary Agency, Inc. In the mid-1950s, it was estimated that a B-52 crew had 15 minutes from to get off the runway in case of a Soviet nuclear attack in order to ensure the ability to strike back at our Cold War nemesis. Bombers sat at the ready on runways around the U.S., thermonuclear bombs already loaded, headsets and operational manuals laid out in the cockpit, awaiting the pilots and crew members as they slipped on special no-lace shoes, and ran to the tarmac. With Doug Keeney’s expertise at sifting through declassified documents and locating hitherto unseen archived artifacts, 15 Minutes is the coldest of Cold War stories—the very scary period between the end of WWII and the coming of the ICBM when America was gripped in the heat of paranoia, desperately needing to be ready to nuke the Russkies before they could nuke us. Following the creation and deployment of the Strategic Air Command, the development of the B-47 and B-52 long range nuclear bombers, the testing of ever larger weapons as we switched over from atomic bombs to hydrogen bombs, and the attempt to plug the radar hole on the east coast by building an manned offshore platform 100 miles out to sea, 15 Minutes tells the stories behind the headlines, uncovering the previously covered-up, and laying out the horrible realties of the mistakes and missteps from 1946 to 1968. Mid-air crashes with live bombs, bombs lost and never recovered, the lives lost in the collapse of the poorly designed and constructed Radar Tower 4 in the Atlantic when an unprecedented storm rolls in, and the disastrous Bravo test shot that was so many times larger than scientists anticipated that it spewed radiation and fallout on our own ships and troops, not to mention contaminating the islands around it, leaving behind a trail of devastation for years to come. 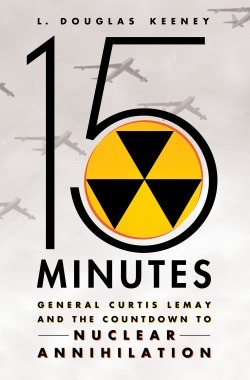 At its heart, 15 Minutes is a human story—the story of the men who planned, built, and lived with the nuclear threat as their sole reason for being, and the story of the men who died trying to make the plans made in Washington into a reality. With the perfection of Intercontinental Ballistic Missiles able to strike Moscow, the SAC began using its enormous stockpile of B-52s for carpet bombing in Vietnam using conventional explosive weapons, ending the era of America’s nuclear vigilance in the skies. L. Douglas Keeney is the author or co-author of ten books and the ghostwriter of two and has been published by HarperCollins, Simon & Schuster, William Morrow and MBI. His books have been reviewed by Newsweek, Salon.com, The New Yorker, and The New York Times. Keeney has appeared on The Discovery Channel, CBS, The Learning Channel and The Military Channel. He is presently the on-air host for On Target.